This baby certainly likes to make his presence known to his mummy! 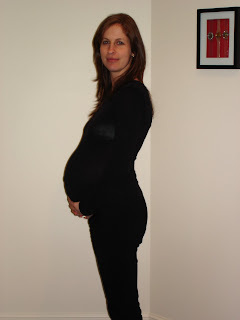 I think that having my placenta at the front last time must have shielded a lot of the movement because I have been absolutely astounded (almost to the point of concern at times!) at the level of activity that this bub gets up to morning, noon and night in my tummy! However, the midwife seems to think that if he has always been active then it's just normal for him! Mark said he thinks the crazy movements look like something out of the movie Alien (which is rather charming I must say! ), I'm guessing that means he is glad it is me carrying this baby and not him! Thankfully as we move into the last 2 or 3 weeks there have been less sharp jabs of feet in my side, instead made up for by more crazy wave like movements. My midwife visit this week went well, my blood pressure is good, baby's heartbeat is strong and even though my tummy was measuring only 31 cm (which is smaller than 3 weeks ago, and about 4cm less than at the same time with Noah), she wasn't concerned as baby is well over halfway engaged in my pelvis already so is sitting very low and ready to go....on the upside I haven't suffered much from heartburn and indigestion but on the downside it is no wonder it has been too uncomfortable to do much walking for a while! Enjoy seeing the crazy belly movements, it never fails to amuse me, although sometimes it is also very distracting!!!! !